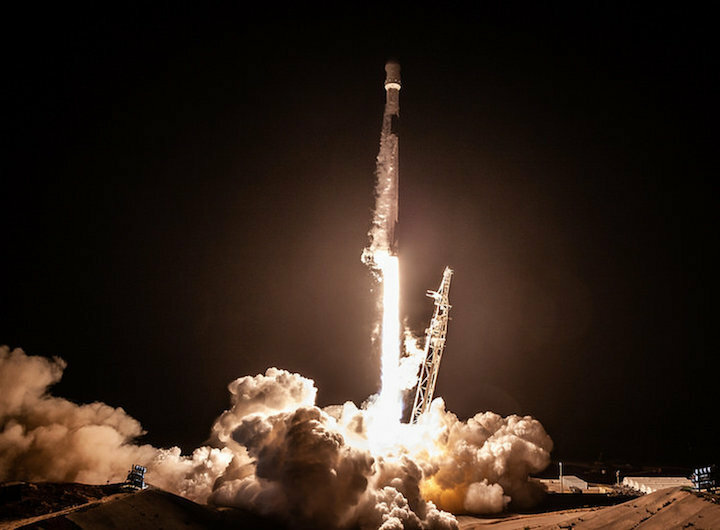 Raumfahrt+Astronomie-Blog von CENAP - Blog: UFO-Forschung: Definitely Not Aliens: These Photos of SpaceXs Night Rocket Launch and Landing Are Amazing! Los Angeles Mayor Eric Garcetti captured this shot of the Falcon 9 plume over the lights of LA on Oct. 7, 2018. All rocket launches are spectacular, but SpaceX took things to another level over the weekend. On Sunday night (Oct. 7), a SpaceX Falcon 9 rocket successfully launched the SAOCOM 1A Earth-observation satellite from Vandenberg Air Force Base on California's Central Coast. And the two-stage booster's first stage landed back at Vandenberg less than 8 minutes after liftoff, pulling off SpaceX's first-ever terra-firma touchdown on California soil. 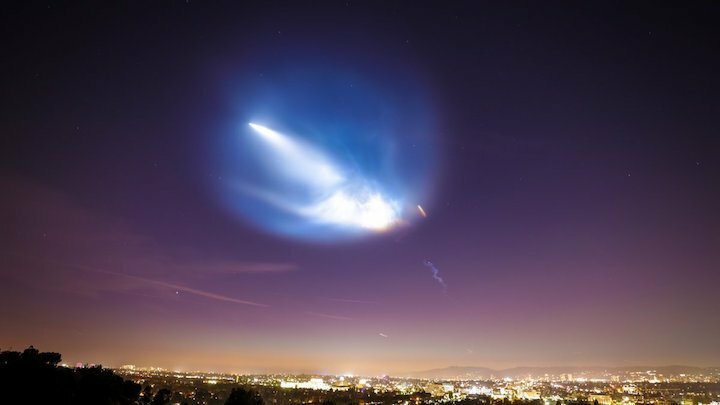 As it rose into the sky, the Falcon 9 spawned a gigantic, gorgeous, glowing cloud that wowed folks throughout the Golden State. The twilight plume had an otherworldly feel, so some observers made a point of stressing the cloud's Earthly origin. 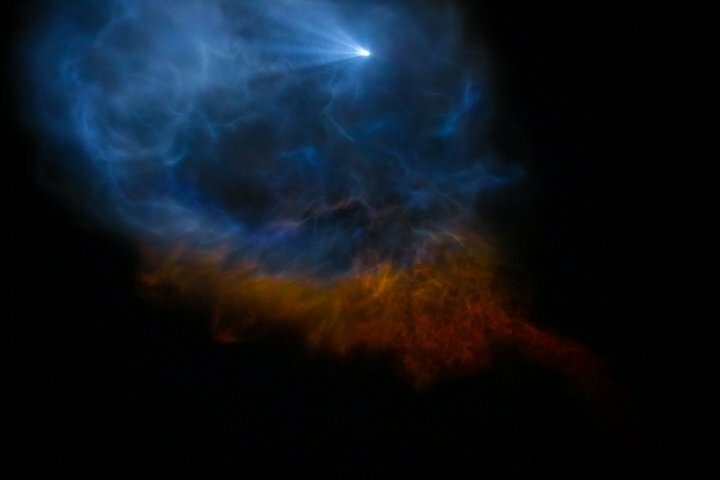 The plume generated by the Falcon 9 launch from California’s Vandenberg Air Force Base on Oct. 7, 2018, looked like something NASA’s Hubble Space Telescope might spy in the vast distances between the stars. Photo by Los Angeles Mayor Eric Garcetti. "Nope, definitely not aliens. What you're looking at is the first launch and landing of the ‪@SpaceX Falcon 9 rocket on the West Coast. 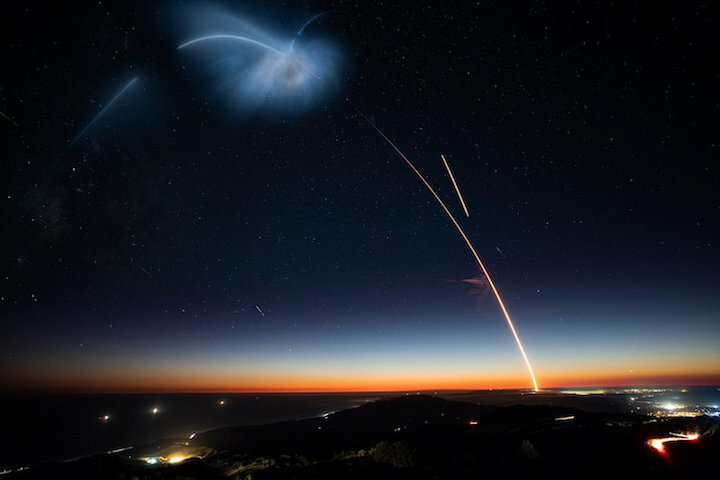 The rocket took off from Vandenberg Air Force Base at 7:21 p.m. and landed safely back on Earth," Los Angeles Mayor Eric Garcetti tweeted Sunday night, along with an amazing photo of the Falcon 9 cloud hanging over the city. 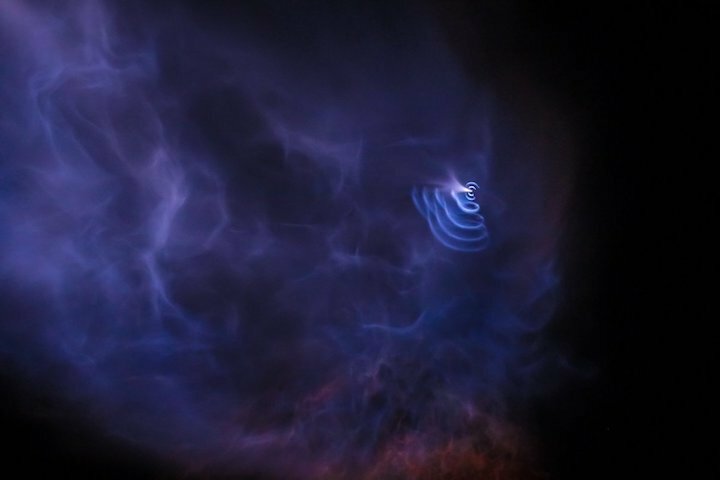 Skywatcher Doug Macmillan captured this shot of the plume created by the SpaceX Falcon 9 rocket that launched Argentina’s SAOCOM-1A radar-imaging satellite from California’s Vandenberg Air Force Station on Oct. 7, 2018. Macmillan was in Del Cerro Park in the Palos Verdes Peninsula, which is near Los Angeles. 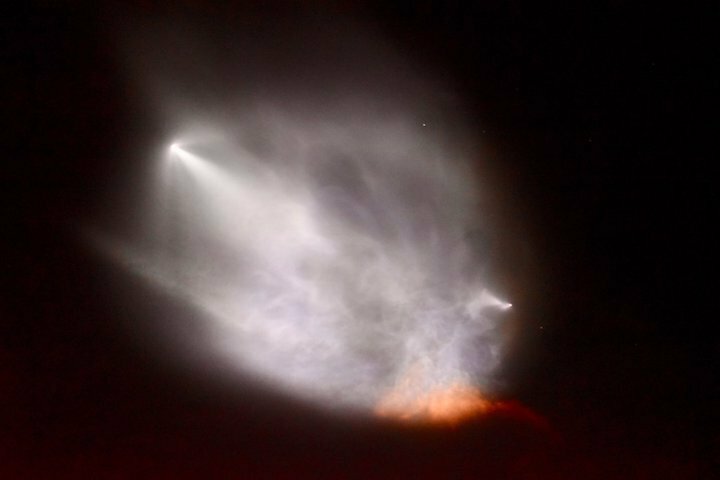 The pulses fired by the Falcon 9 first stage’s small reaction-control thrusters as the booster headed back to Earth carved a Wi-Fi symbol into the sky, as captured in this shot by Los Angeles Mayor Eric Garcetti. Astrophotographer Sean Parker viewed the launch from Joshua Tree National Park in southeastern California and was suitably excited by the sky show. 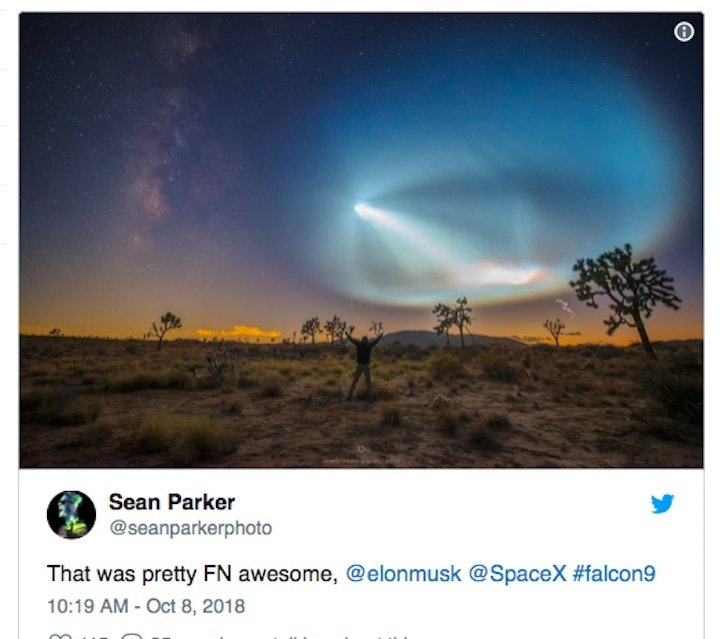 "That was pretty FN awesome, @elonmusk @SpaceX #falcon9," Parker tweeted yesterday (Oct. 8), along with a photo of himself exulting in the desert beneath the glowing cloud. This photo captures all of the SpaceX action on Oct. 7, 2018: A Falcon 9 rocket launching the SAOCOM-1A satellite from California’s Vandenberg Air Force Station; the plume created by the liftoff; and the Falcon 9’s first stage coming back to land at Vandenberg (short orange arc at right). And then there are the close-up views of the launch and landing, which SpaceX snapped. These photos are spectacular in a different way, highlighting power and precision rather than abstract and ephemeral beauty. But they are spectacular nonetheless. SAOCOM 1A, by the way, was developed by Argentina's national space agency. The satellite will observe Earth in radar light from its perch about 385 miles (620 kilometers) above the planet, primarily to measure soil-moisture levels. This information will aid predictions of crop yields and also help planners and emergency-management officials monitor disasters such as floods and fires. The first stage of a SpaceX Falcon 9 rocket made history with this landing at Landing Zone 4 at California’s Vandenberg Air Force Station on Oct. 7, 2018. The touchdown marked SpaceX's first-ever West Coast landing of a Falcon 9 rocket. SAOCOM 1A has a twin, SAOCOM 1B, which will make similar observations. SAOCOM 1B will also launch aboard a Falcon 9, perhaps as early as next year. 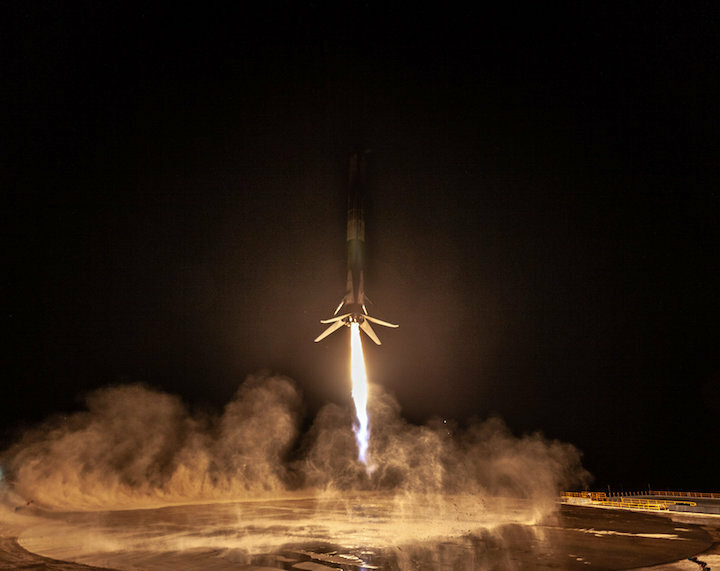 UFO-Forschung: Definitely Not Aliens': These Photos of SpaceX's Night Rocket Launch and Landing Are Amazing!